Head on over to the downloads page to get the July edition of Lode Runner: The Mad Monks' Rewrite. If you find anything at all that is wrong with the game so far, please get in touch with me. In July alone, over 20 bugs/quirks were found by the Lode Runner community and fixed. Your feedback is very important to making this project as good as it can possibly be. The next build will be at the end of August. Continue reading for a summary of all the fixes, improvements and new features inthe July update. Improving the AI is a permanent task. I spent several hours a week on this along so don't worry, it is being actively worked on. If both runners are unreachable in a puzzle, the monks will not do anything unless they are on the row 2nd from the bottom. This is me working out what the monks do. The August build will have this feature finished. You can now choose to play with the quirks/bugs from the original Lode Runner Online: The Mad Monks' Revenge by enabling "Quirks Mode" in the options. You can read what quirks are included in this mode in this detailed blog post. This feature was requested quite a few times so it was added. If you have a feature you'd like to see, please get in touch. You can also read the FAQ for more information on feature requests. The game options dialog was updated to support the changes needed for this build. Gamepad support was added to the July build. You can now choose to play with a supported game controller (such as an Xbox One/360, PlayStation, or a generic model). Like the keyboard but unlike joystick support in the original, you can assign any button/joystick/trigger on the gamepad to any movement/action you wish. Force feedback/vibrations occur when bombs explode, pick-axe strikes and getting buried under rubble, being strung up in a rope trap and drilling with the jackhammer. If you'd like to see more of these, please let me know. Support was added to allow more languages apart from English. At current, only English (default) is available and French for the file dialog. Foreign languages will be an ongoing task since the original Lode Runner font does not have any non-English characters, I will have to draw them. A new single and two-player game dialog was added. The original was too confusing for a first time player, had too many buttons and too much empty space. 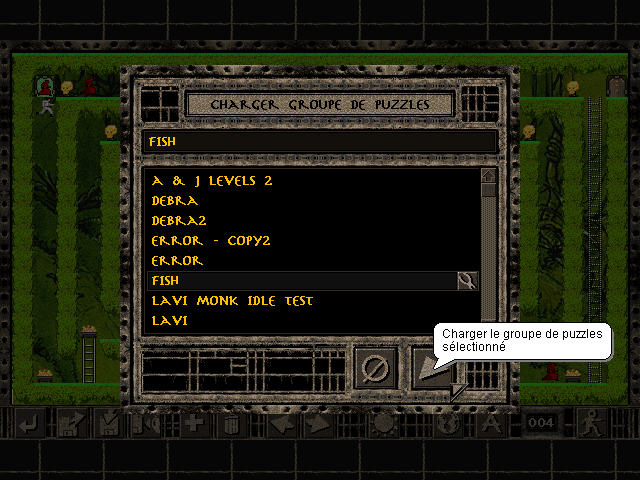 The improved dialog focuses more on choosing a puzzle to play visually.